Pressure mounted Wednesday for Las Vegas police to explain how quickly they reacted to what would become the deadliest mass shooting in modern U.S. history after two hotel employees reported a gunman spraying a hallway with bullets six minutes before he opened fire on a crowd at a musical performance. On Monday, Clark County Sheriff Joe Lombardo revised the chronology of the shooting and said the gunman, Stephen Paddock, had shot a hotel security guard through the door of his suite and strafed a hallway of the Mandalay Bay hotel and casino with 200 rounds six minutes before he unleashed a barrage of bullets into the crowd. That account differed dramatically from the one police gave last week when they said Paddock ended his hail of fire on the crowd in order to shoot through his door and wound the unarmed guard, Jesus Campos. "These people that were killed and injured deserve to have those six minutes to protect them," said Chad Pinkerton, an attorney for Paige Gasper, a California college student who was shot under the arm in the attack. "We lost those six minutes." 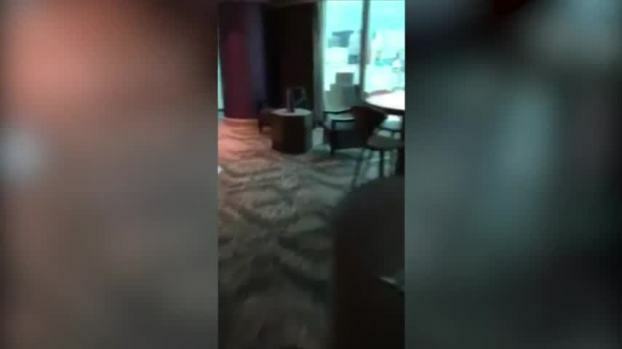 Amateur video footage has emerged showing the room at the Mandalay Bay Hotel in Las Vegas from where Stephen Paddock rained down bullets onto a concert crowd on Sunday evening, killing 58 people. Jeff Bridges and his partner, who were guests at the hotel in January last year, stayed in the same room where Paddock launched his attack - room 32-135. During his stay, Bridges filmed the room and the view from the windows, which included the concert venue; identical to the view that Paddock had of the venue on Sunday evening. Maintenance worker Stephen Schuck told NBC News that he was checking out a report of a jammed fire door on the 32nd floor of Mandalay Bay when he heard gunshots and the hotel security guard who had been shot in the leg peeked out from an alcove and told him to take cover. "It was kind of relentless so I called over the radio what was going on," Schuck said. "As soon as the shooting stopped we made our way down the hallway and took cover again and then the shooting started again." Gunshots can be heard in the background as Schuck used his radio to report the shooting, telling a dispatcher: "Call the police, someone's firing a gun up here. Someone's firing a rifle on the 32nd floor down the hallway." Campos also used his radio and possibly a hallway phone to call hotel dispatchers for help, police have said. It was unclear if and when the hotel relayed the reports of shots being fired to police. Las Vegas authorities did not respond to questions about whether hotel security or anyone else in the hotel called 911 to report the gunfire. "Our officers got there as fast as they possibly could and they did what they were trained to do," Las Vegas assistant sheriff Todd Fasulo said previously. 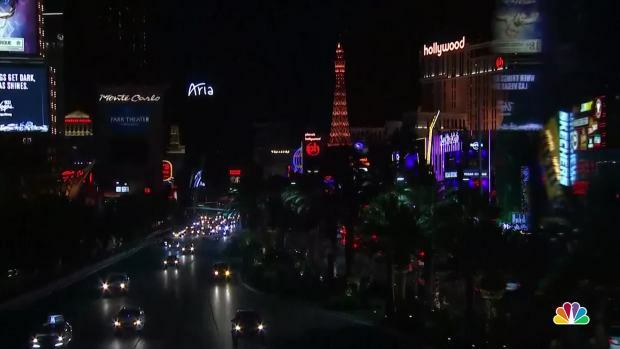 The iconic Las Vegas Strip dimmed its lights exactly one week after the shooting at the Route 91 Harvest festival to commemorate and honor the 58 people who died during the attack. The parent company of the hotel has raised concerns that the revised timeline presented by police may be inaccurate. DeShong declined to comment on a lawsuit filed Tuesday by lawyers for Gasper against the company, concert promoter, gunman's estate and the manufacturer of the "bump stocks" used by the gunman to help mimic a fully automatic firearm. Undersheriff Kevin McMahill earlier defended the hotel and said the encounter between Paddock and the security guard and maintenance man disrupted the gunman's plans, but he would not comment on the revised timeline. "MGM and the people associated with the MGM and people involved that night at the event did a fantastic job," McMahill said. The six minutes wouldn't have been enough time for officers to stop the attack, said Ron Hosko, a former FBI assistant director who has worked on SWAT teams. 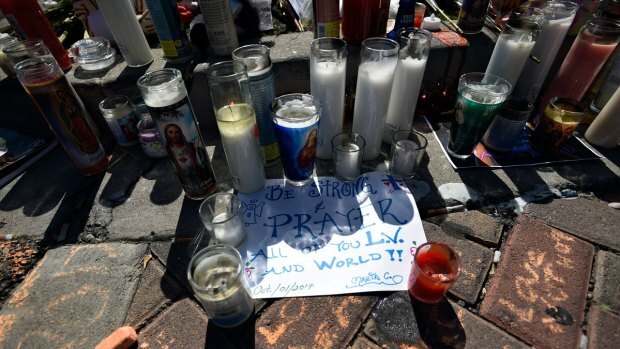 Rather than rush in without a game plan, police would have been formulating the best response to the barricaded gunman, he said.